We in the L&D space easily understand the structure of these blended program, mainly because we designed the programs and know how the various deliverable types and modalities will benefit the learner on their journey. However, this might not be so obvious to learners. L&D professionals need to provide learners a path for that journey—a map. This ensures that learners understand what the learning journey will be, what it involves, and how they will check off the boxes on their learning to-do list. Workers today have a lot on their plates, and the learning part of their job is often considered to be completed outside of their regular duties. L&D should provide guidance for the learner, helping to make the usage and completion of assigned learning programs as painless as possible. A learning map acts as a guide for your learner where an actual tour guide isn’t available. A learning map provides immense value to your training programs, and it engages the learner along the way. Let’s outline what a learning map is and how it can be used. What does a learning map contain? A learning map can be a simple one- to two-page document, or a more complex multi-page guide. At its foundation, a learning map identifies the different deliverables in a training program and the order the learner will complete them. Below is a graphic outlining a basic program. 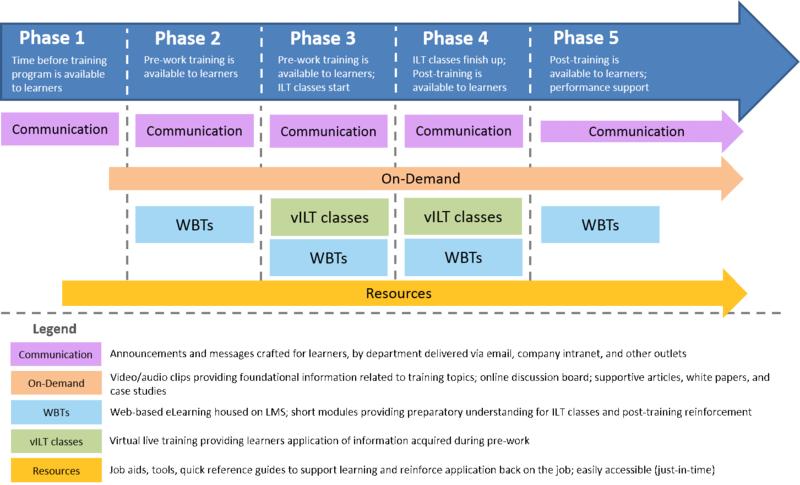 This graphic provides the learner a bird’s eye view of the overall training program. The learner can quickly digest what will happen and when. Expectations are established, and the learner can see the journey ahead. This simple version can go into greater detail depending on the needs for the specific audience. How are learning maps formatted? Learning maps can be formatted in a variety of ways. As with any training deliverable, the L&D group should determine the ultimate need of the learner and the technology available, as well as time and budget available. As stated earlier, a simple learning map can be a one- to two-page document. In this instance, the document can be created in any program (Word, PowerPoint, etc.) and then saved as a PDF for delivery to the learner. A more complex learning map that acts as a comprehensive guide can also be created in the software mentioned above, or in development software, such as InDesign or Captivate. Again, the purpose, use, and technology available will drive this answer. Learning maps can be static pages providing information in a direct way. They can also be interactive documents allowing the learner to explore the various elements of the program, and the map itself, by clicking on programmed elements within the map. To explain this further, refer to the image presented earlier. In the instance of an interactive learning map, learners can click different blocks that represent different learning engagements, thus leading them to more detail. Those linkages can be contained within the document, sending the learner to sub-pages for the detail. The linkages can also drive learners outside the learning map itself, possibly to the organization’s social network, bulletin board, file storage, etc. How are learning maps delivered, accessed, and used? Learning maps can be delivered using any type of electronic file delivery format. It is recommended that the learning map is housed on a central place (L&D portal) and that the communications around the program and the map itself are directed back to that central place. Of course, the learning map can be delivered via email, but leveraging the L&D portal and redirecting learners there will provide consistency for the learner for where to access essential tools and resources. 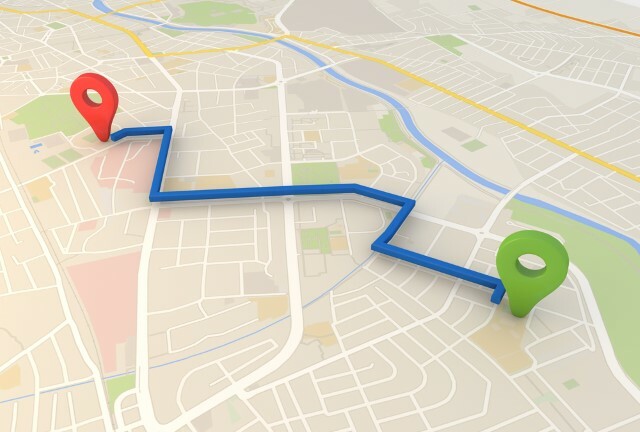 As communications continue about the training program, direction and redirection to the learning map should be a standard element. Learning maps can also be housed in the organization’s learning management system, or LMS. Doing so will help L&D track access across the learning audience. In the initial communications to the learners about the training program, it’s important to have an explanation of, access to, and a description of what to do with the learning map. This can be done in a specific communication about the learning map itself, explaining its value and defining the benefits of the tool for the learner. Learning maps can be a high-level reference providing learners the “You are here!” marker for where they are in the journey. In addition, as stated earlier, the map can be a tool the learner uses at each stage of their journey, allowing them to document their progress and journal about their experience. This can be immensely helpful for training program content that involves more coaching and performance support across the length of the program. When designing a learning map, L&D departments are wise to enlist the partnership of the department for which the training program is being built. These departments will benefit from the education on the value and use of a learning map for that department’s workforce. The learning map can easily be an enhancement for how that workforce is developed. A simple tool, a learning map quickly adds value to a comprehensive blended learning program. It provides guidance for learners while also engaging them along their learning path.